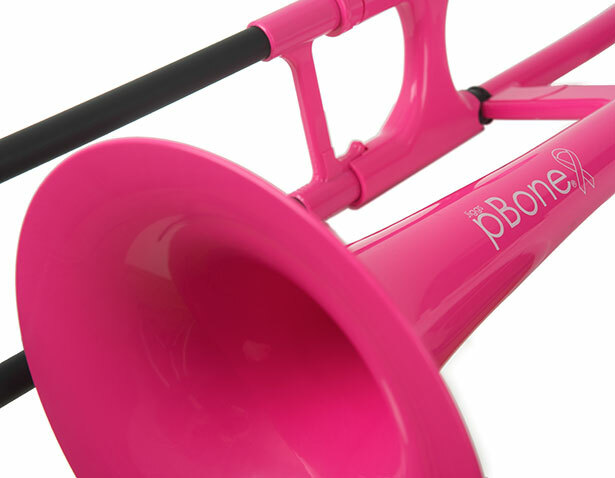 pBone is delighted to announce the release of its pink pBone. 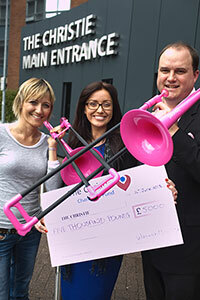 With the support of Vincent Bach International, pBone will be donating £10 from the sale of each pink pBone in the UK to The Christie, one of Europe’s leading cancer centres. 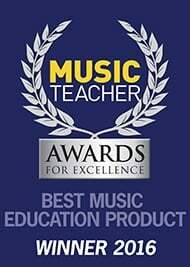 The Pink pBone is the newest addition to the bright and colourful range of award-winning musical instruments, which have taken the trombone world by storm during the past 3 years; it will be available for sale online and in specialist instrument retailers from mid June 2013. “The Christie do amazing work and strive to raise money to fund projects that lie outside the scope of the NHS, including projects like the fully equipped music room for patients on the Young Oncology Unit, which has support from a music specialist. Patients take part in group sessions, learn to play an instrument or make a recording. As well as offering a means for young people to express their feelings and fear following a cancer diagnosis, these activities offer patients a distraction from their treatment or relieve the boredom of having to stay in hospital often for several weeks at a time during treatment. This fundraising initiative is the latest of Warwick Music and pBone’s charitable commitments; which have also seen them take instruments, music and teaching to children in Africa earlier this year. Or why not visit the official pBone Facebook Page to see all the fun people are already having with their pink pBones.